BLaST IU 17 operates a number of inter-district programs for children with special needs from various school districts in Bradford, Lycoming, and Tioga Counties. 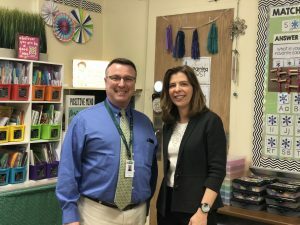 Dr. Steinbacher-Reed had the opportunity to visit three classrooms recently to see firsthand how BLaST staff carry out the vision of the organization. Timothy Hanner, Special Education Supervisor for BLaST IU 17, led the tour which showed some of the services and programs offered by BLaST, such as: Life Skills, Learning Support, Multi-Disabilities Support, Emotional Support and Autistic Support. The day began in Ms. Ashley Rupert’s multi-disabilities support classroom at Loyalsock Valley Elementary School. This class of mostly non-verbal students follows the Project MAX ideals- MAXimizing Access and Learning. The purpose of Project MAX is to increase the capacity of schools to provide all students, including those with complex instructional needs, with access to the general education curriculum. 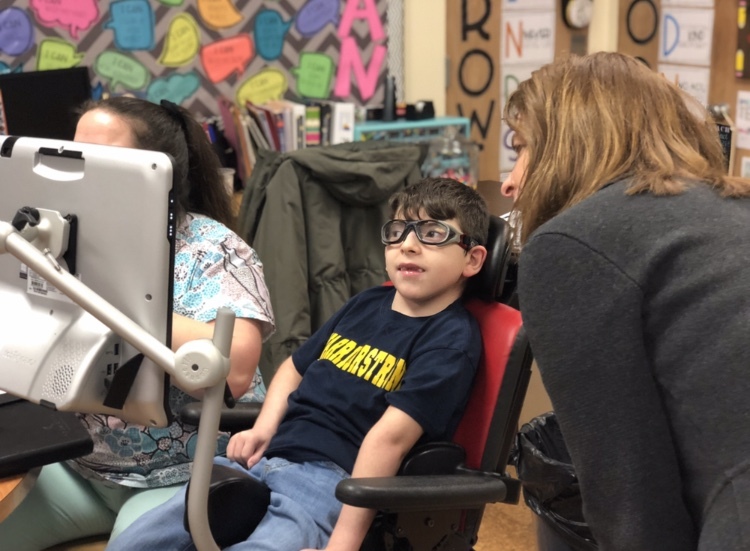 They met one young man, Ryan, 9, who showed off his Tobii Dynavox device, a vital support which makes communication easier through his eyes while he looks at preprogrammed pictures on the screen. Assistive Technology Consultants and his Speech Therapist from the IU teach the staff, student and families how to use the Tobii device. “It’s important to me to see how our highly skilled staff are using assistive technology to help students communicate and learn. We change lives through our education services,” said Dr. Steinbacher-Reed. They continued on to observe Ms. Kiersha Whitehead’s Learning Support class at McCall Middle School. Students were busy in science class learning about chemical changes. Dr. Reed went around to each student to shake hands and introduce herself. At Montoursville High School, they resumed the tour in Ms. Erica Logan’s Life Skills Support class. Students were drumming away on the floor, chairs and desks while at the same time learning math place values. As a Drums Alive instructor, Ms. Logan incorporates this unique sensory motor drumming program into her teaching. Working closely with their partner districts and MDE/IEP teams, BLaST staff provide meaningful educational programs designed to meet the unique learning needs of all students.